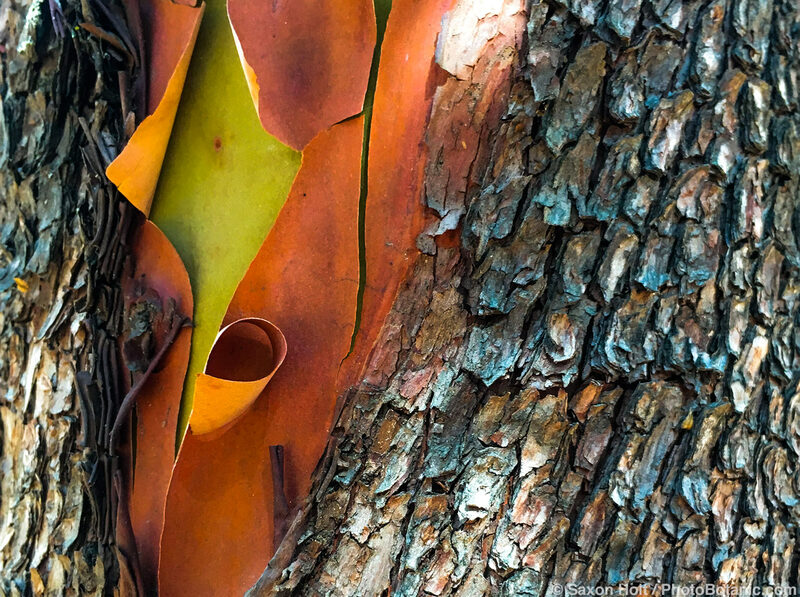 Some of our favorite plants and gardens for summer-dry climates. Every so often it is worth reconsidering a once wildly popular plant that, apparently for no reason other than overexposure, has fallen completely out of favor. Agapanthus is one of those plants. Oleander (Nerium oleander) is certainly another. Overplanted in housing developments and along freeways in the 1960s and ‘70s, oleanders now seem to be seldom planted except by those who appreciate the dense screening provided by their lush evergreen foliage, their lengthy period of exuberant flowering, and their robust constitution. Oleanders are astonishingly tolerant of drought, reflected heat, wind, salt spray, poor soil, neglect, severe pruning, and almost every other insult that can be directed their way. Other than full sun and occasional summer water until fully established (which can be five years or more), oleanders seem to have few requirements. One thing they cannot stand is prolonged freezing, although even from that they may quickly recover. Forty years ago I planted oleanders in gardens I made for others. Twenty-five years ago I planted them in my own garden as a screen between me and my neighbors. A dozen years ago I cut them to the ground and authorized their destruction by backhoe during a major garden renovation. They sprang up again and are still thriving. Faced with such determination, who am I to say they cannot remain? Native to or naturalized in warm temperate and subtropical areas from southern Europe and north Africa east to southwest Asia, oleanders are upright woody shrubs eight to ten feet tall and wide, although there are dwarf cultivars half that size and others that reach heights of eighteen to twenty feet. All have long, narrow, lance-shaped leaves and funnel-shaped flowers in showy clusters at the ends of branches. Flowers are pink, red, white, salmon, or yellow and some are lightly scented though, lacking nectar, they are not noticeably attractive to bees and butterflies. Pittosporums are a large group of tough and adaptable evergreen shrubs or smallish trees native to subtropical and tropical Australasia, Africa, and Asia and grown in warm temperate climates throughout the world. Most are fairly fast growing in full sun to part shade in any reasonably fertile soil with decent drainage and little to moderate moisture. All bear small, fragrant, late spring or summer flowers in clusters at the ends of stems followed by conspicuous fruits with bright orange seeds. Several species and quite a few cultivars are commonly found in the nursery trade. 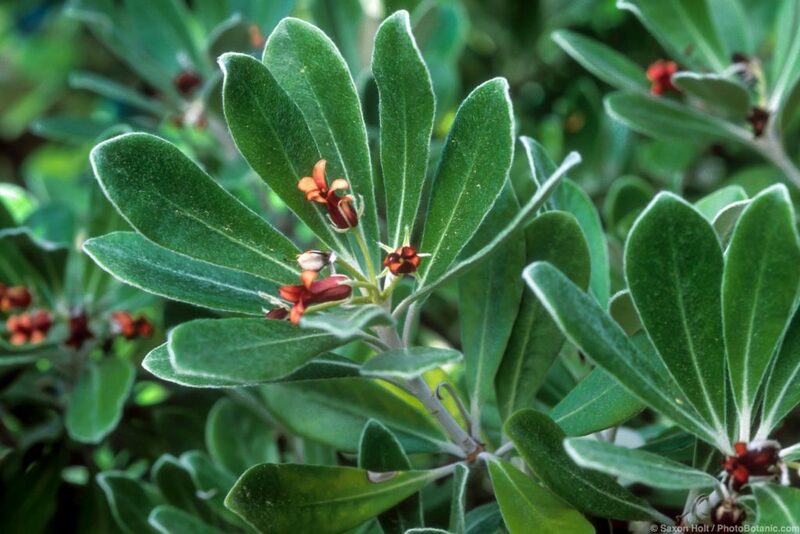 Pittosporum tobira is a rounded shrub to 15 feet tall and ten feet wide with leathery, dark green leaves, shiny on the uppersides and slightly turned under along the edges. The small, intensely fragrant flowers open white and soon turn creamy yellow. Native to Japan, Korea, and parts of China, this densely foliaged plant makes a fine hedge or privacy screen and is attractive with lower branches pruned up as a small specimen tree. 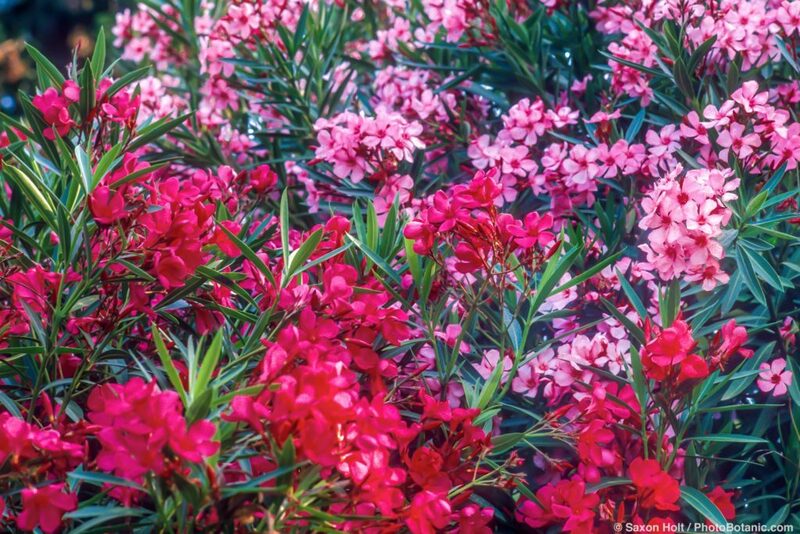 The cultivar ‘Wheeler’s Dwarf’ is two to three feet tall and four to five feet wide. ‘Variegata’, three to five feet tall and wide, has variegated leaves. Pittosporum tenuifolium, 25 to 30 feet tall and 15 to 20 feet wide, bears glossy, medium green, slightly wavy leaves on distinctive nearly black stems that accentuate the upright form of this attractive shrub. The flowers are dark reddish purple. Native to New Zealand, it is tolerant of salt spray, dry soils, and shade. Many cultivars are in the trade, including ‘Golf Ball’, an amusingly rounded shrub three to four feet tall and wide with exceptionally dense foliage, and ‘Marjorie Channon’, eight feet tall and wide with creamy white margins on the leaves. Pittosporum eugenioides is a shrubby tree to 30 feet tall and 15 to 20 feet wide with wavy-edged, glossy green leaves and yellow flowers. Native to New Zealand, it makes a good, fairly fast-growing screen. It needs part shade away from the coast. Pittosporum phillyraeoides, slow growing to 20 feet tall and 15 feet wide, has narrow, dark green, willow-like leaves and a weeping habit. 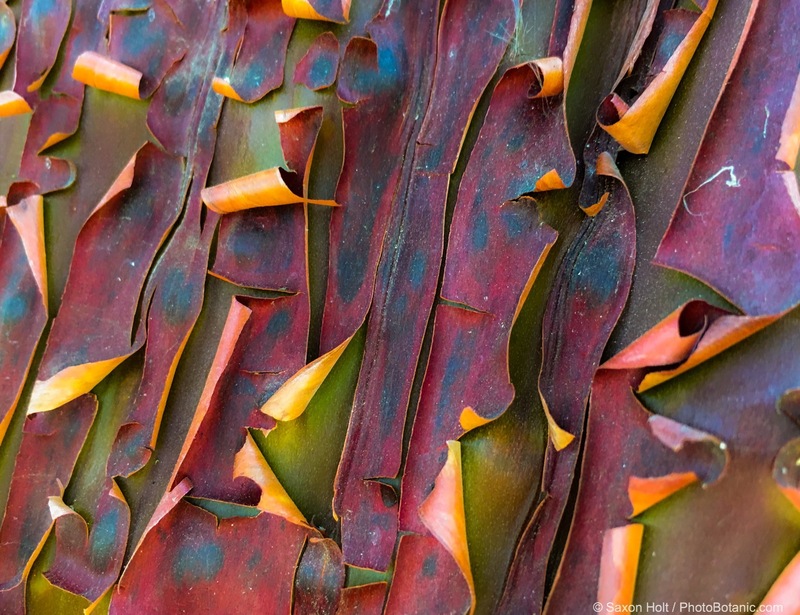 Native to coastal northwestern Australia, it is tolerant of considerable heat and dryness. Attesting to the wide adaptability of most plants in the genus, at least two pittosporums have become weedy pests in Australia, while others occasionally have been described as “garden thugs.” All probably should be watched for any inclination to take over or escape. The worst offender is Pittosporum undulatum, commonly known as Victorian box, which is highly invasive in Australia and South Africa. P. crassifolium, an attractive gray-leaved shrub with maroon flowers and several named cultivars in the trade, has also shown invasive tendencies in Australia. I should put in a good word for Pittosporum tobira in this regard, three large shrubs of which graced the wooded portion of my lot when I settled here almost forty years ago. Mature then, they are elder statesmen now. They make a fearsome mess in winter with their sticky discarded seeds, but these are loved by birds and not once have I seen new plants appear. Is The Drought Over ? 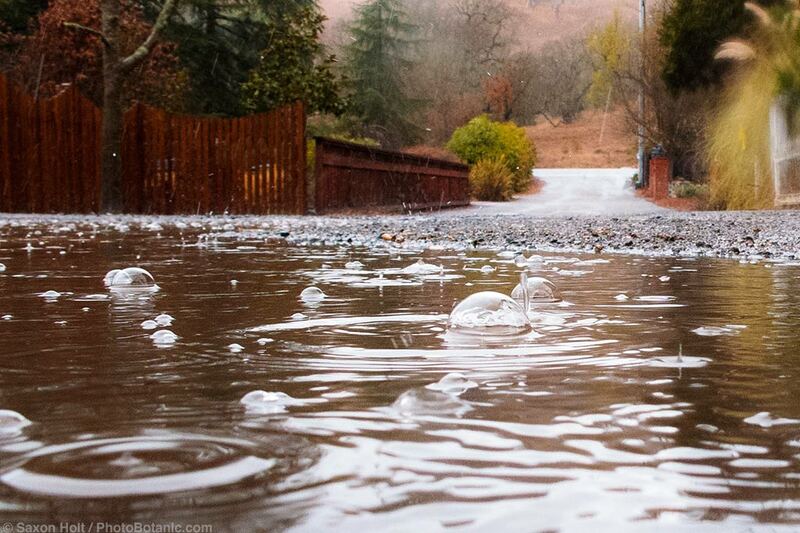 It has been raining like crazy in California this winter. Or rather, it has ben raining like a normal winter. In a summer-dry climate we expect it to be winter wet. But is the California drought over ? Here is a map showing the overall change in exactly one year, since February 2, 2016. While it has been a dramatic change it its not over; Southern California is still below average. Although there is above average snowpack in the mountains, which will insure adequate water, the State is still experiencing water supply shortfalls and five years of drought have left California with a significant water supply deficit, especially when it comes to groundwater basins. Who decides when the drought is officially over ? The State Water Resources Control Board will vote on Feb. 8 whether or not to officially extend drought regulations. Item 9. Water Deeply In-depth coverage of the California drought. 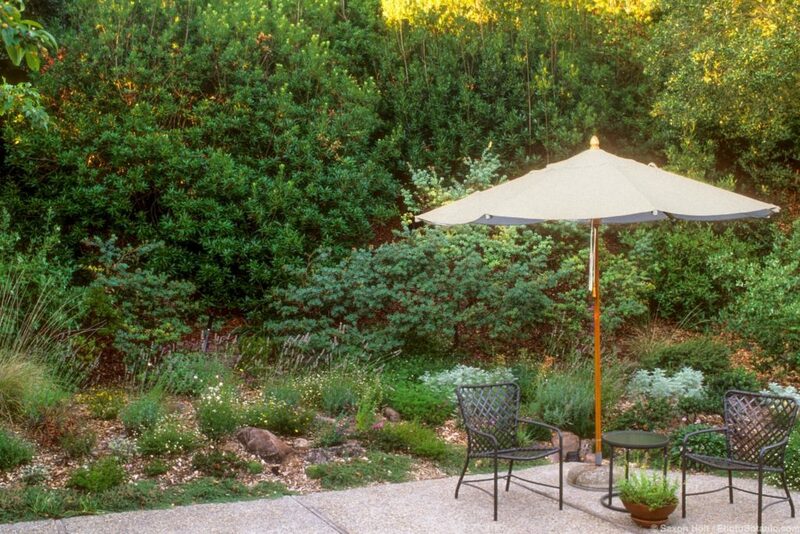 Pacific wax myrtle (Myrica californica) is a tall, dense evergreen shrub, perfect as a backdrop for any garden large enough to accommodate it. Fast-growing, adaptable, and good looking year round, this is a fine choice for informal hedges, windbreaks, and privacy screens. You will hear that Pacific wax myrtle can be sheared as a formal hedge, but don’t do it. Shearing destroys the natural grace of the glossy green leaves, which are long and narrow, softly serrated, and elegantly displayed on multiple upright stems. If you find its height of 12 to 20 feet too tall or its spread of 10 to 15 feet too wide, this shrub is easily maintained at smaller sizes by hand pruning. 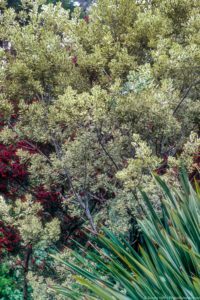 Native along the coast and in coastal valleys from southern California to southern British Columbia, Pacific wax myrtle will tolerate almost full shade inland, but full sun to part shade is best. It accepts dryish conditions, but responds enthusiastically to summer watering, especially in interior gardens. It is at its finest in full sun in foggy coastal gardens, where it thrives in sandy soils and wind. The luscious leaves of this plant look like deer salad at all ages and all times of year, but my deer generally ignore it after a nibble or two when plants are first set out or when new bright green leaves appear in spring. Clusters of tiny yellowish spring flowers are followed by small, waxy, purple-black berries that are popular with many birds. 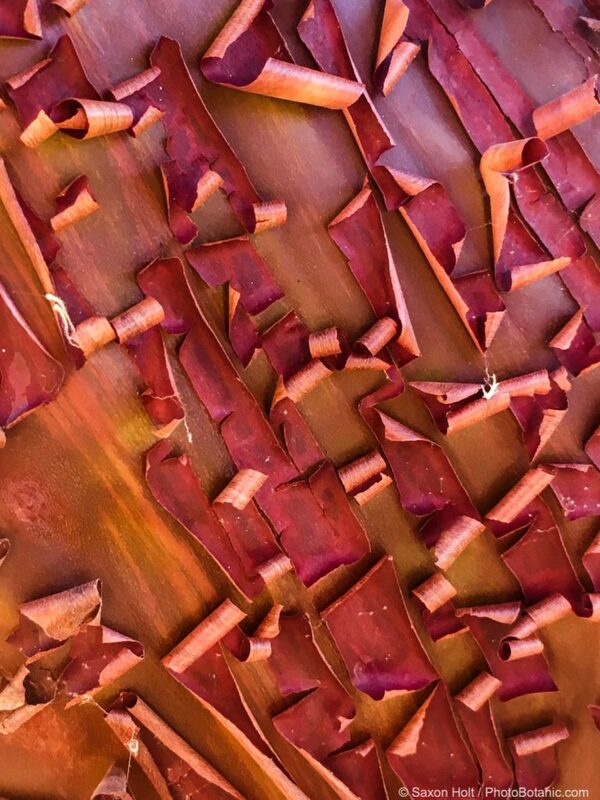 The scientific name of Pacific wax myrtle was changed to Morella californica, but you may not see it listed or sold as such until the change is embraced by those who have long known and grown this plant as Myrica. Gardeners who relish a bit of a challenge and delight in a smashing success probably already grow California’s native bush anemone (Carpenteria californica).This is a connoisseur’s plant, elegant and refined virtually year round and seasonally extravagant in its flowering. Where it is happy — and there’s the catch — it is surprisingly easy to grow. 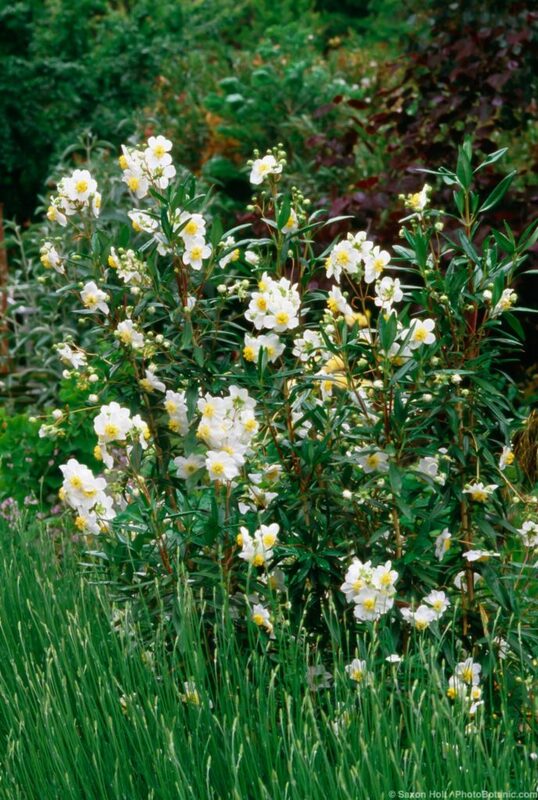 This splendid multi-stemmed shrub is grown mostly for its impressive early to midsummer display of large, glistening white, lightly fragrant, simple but showy flowers with bright yellow stamens. Carpenteria is evergreen, with long, narrow, somewhat leathery, dark green leaves that are grayish white on the undersides. 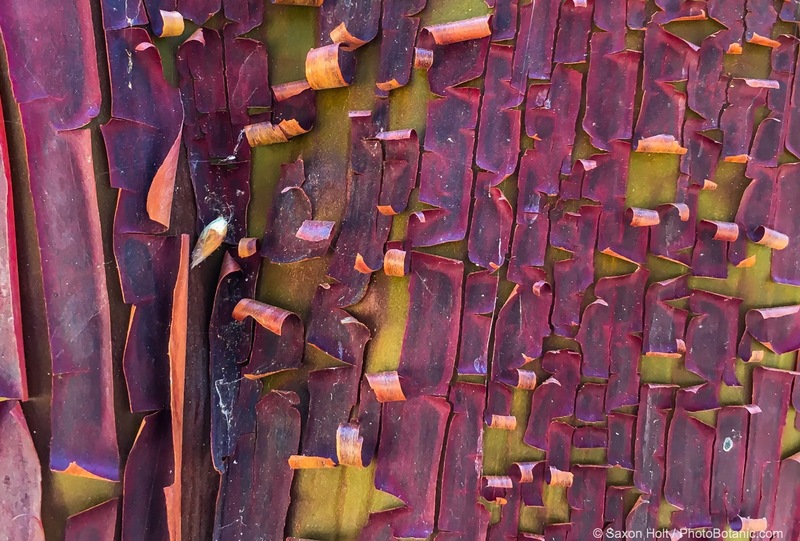 New stems are dark red or purplish, shredding with age to reveal tan-colored bark beneath. Upright and generally taller than wide, carpenteria can be kept to six feet tall and four feet wide with annual post-bloom pinching back. Left on its own, it eventually will grow larger and may become open and rangy. Carpenteria accepts full sun along the coast, but prefers high shade or afternoon shade inland. It will grow in full shade, but may have fewer or smaller flowers. 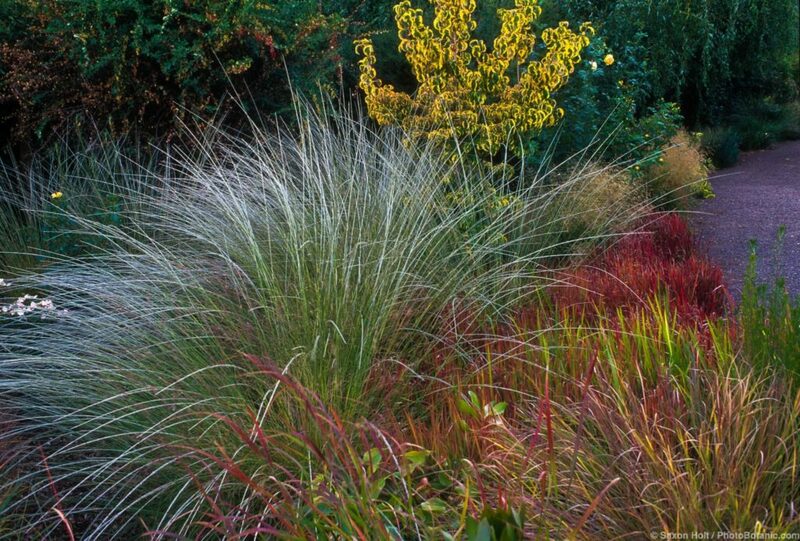 Tolerant of some dryness once established, it looks best with occasional to moderate deep watering in summer. As with most California natives, it is best to plant carpenteria in the fall. If your soil is heavy clay, plant on a mound or a slope for good drainage. For at least the first year, water deeply twice a month — more in hot interior locations. Gradually cut back on watering as the plant becomes established. Do not be alarmed if leaves droop, curl under, or turn yellow in the hottest weeks of the year. This is a natural response to heat and drought. Mulch, water deeply to moisten but not drench the soil, tip prune, and wait for the plant to respond to the cooling days of fall.